Hello and welcome back to Ultra Budget Brews, where we prove weekly that “Magic content of the poors, by the poors, and for the poors, shall not perish from the internet.” It’s also the article series where historical quotes are butchered and tangentially related gifs and memes are repurposed in an attempt to dazzle and entertain you, the reader. Oh yeah, we also build entire EDH decks in which no single card costs more than $1. We had a lot of votes last week, which is awesome. You voting means that you are interested in and enjoy how I build decks and that you want to see more of it, which is encouraging…unless you are voting for what you think is most difficult in order to punish me for my hubris. Either way, thanks, and keep voting. I try to pick commanders that are interesting to build and not overly popular. There seems to be at least some amount of negative correlation between what you all vote for and how many decks that commander has on EDHREC. Knowing this, I totally thought Polukranos was going to run away with this one, so much so that I actually had already started brewing it. Apparently, there is at least one way that I’m like Jon Snow. Also, I have flowing locks and am definitely not already going bald. One of the most popular ways to build Vela is ninjas. Despite the fact that she isn’t a ninja, she actually has quite a bit of synergy with ninjas. Ninjitsu requires unblocked creatures, which Vela enables, and bounces creatures back to your hand, which triggers Vela’s ability. This isn’t to say things are perfect. First, and most glaringly, she is not a ninja. 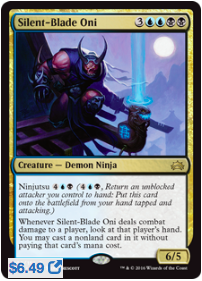 The only legendary ninja available to us is mono-blue (Higure the Still Wind) which cuts out a lot of awesome ninjas. Wizards does a pretty good job about printing commanders for popular tribes, so it is likely they will eventually print a U/B colored ninja legendary and hopefully it’ll be awesome when they do (*stares at Ulrich of the Krallenhorde apprehensively*). The other issue with building her as a ninja commander is that there are only a handful of actual ninjas, 10 to be exact. Also, for our purposes, some of them are too expensive. So, if we can’t effectively build her as a ninja commander, what direction should we go? I’m going to be honest, this deck took me longer to come up with than any other for this series. Since I had such a difficult time building this deck, I thought it could be interesting to go through my deck building process. Maybe it’ll be enlightening. Maybe you’ll think I’m crazy and that you should definitely have this job. Maybe you’ll skip this section entirely and go to the decklist. Either way, let’s take a look. 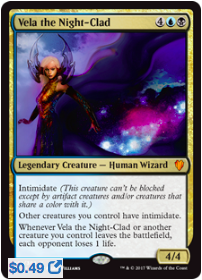 Vela’s ability is powerful, but a lot of the cards that really work well with her cost too much for this series. In addition, as mentioned, above ninjas are too scarce to build around. 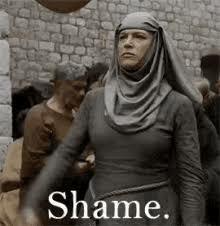 Also, I never want to simply look at a commander’s EDHREC page, write down all the cards that come up that cost under $1, and write an article about a deck I ‘built’. EDHREC is at its best when it’s used as a tool. It will inform you about cards that are blatantly powerful in the deck and the ways that are most popular to build the deck. My personal favorite way to use the site is to pick a card that has a powerful, unique ability from the cards listed under my chosen commander, and find cards that synergize well with it. This card loves unblockable creatures, which Vela loves as well, and can pack quite the punch, even if it doesn’t exactly come out of nowhere. The problem is that you really need a bunch of creatures to make the activation worthwhile. 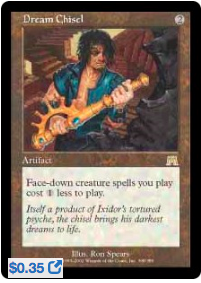 Tokens would be a good route, but U/B doesn’t do tokens very well, and the cards that do make tokens, like Chasm Skulker, are outside of our budget. So while this card made the deck, it wasn’t a card or an ability I could reliably build around. This card is fantastic. It draws you cards and returns permanents to your hand, protecting them from a boardwipe or bad combat step, helps you get ‘enters the battlefield’ triggers again, and triggers Vela’s ability. Sadly, this too isn’t an effect we can build around. It lends itself to combo decks involving cards like Paradox Engine, Aetherflux Reservoir, and a boatload of mana rocks. We can afford exactly one of those things and, even if we could afford them, we wouldn’t want Vela as the commander of that deck. The card definitely is good enough to make our deck, but is a nothing more than a (situationally powerful) roleplayer. At this point, I was feeling more than a little stuck. I started clicking on anything that looked remotely interesting and eventually came upon a card that I’ve been blown out by my fair share of times. Willbender. Morph creatures. 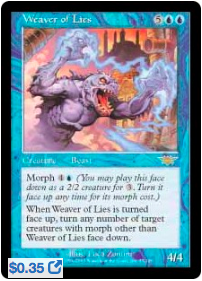 Morph creatures work well with Vela, because they are only blockable by other colorless creatures. They also don’t mind being returned to hand because you can then get a second use out of the morph ability. Also, morph creatures are pretty cheap, so that works in our favor. I’ve always thought morph creatures would be interesting to build around, so lets give it a shot! So you can see we are running a huge amount of creatures, particularly for a U/B deck. U/B decks are not known for being creature heavy, so it’s likely to play differently than your average controlling U/B commander, Sygg, River Cutthroat likely being the best comparison. We have a few avenues of attack. The first is to play cheap unblockable creatures to do damage to our opponents and to enable our ninjas. 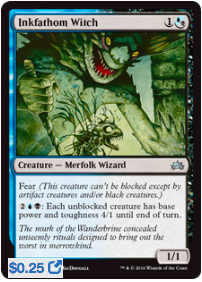 A number of our difficult to block creatures have on hit effects, often drawing us cards. 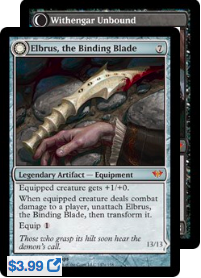 We also have artifacts that provide the same bonus (Mask of Memory and Bident of Thassa). This part is more or less a ‘normal’ Vela deck. The part that gets more interesting is our morph creatures. We have lots of them. We will almost always play them facedown as 3 mana 2/2’s. These stats aren’t great, but the next turn you will likely be able to start attacking with them and hopefully not meet a ton of resistance because your opponents have no idea what you might morph them in to. If you plan on attacking with your morph creatures, it is important that you have mana up to threaten flipping them, or combat will likely go really poorly for you. The second main phase is your best friend. Use it as such. Your morph creatures all have powerful effects that happen when you flip them. 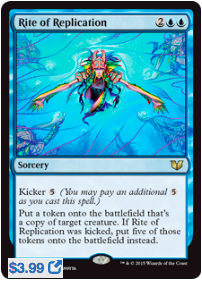 Typically these things are single use effects, but with our ninjas and other bounce effects, we are often able to bounce the morph creatures back into our hand for value, and then replay them to get a second use out of them. This is the part of the deck that sounds the most fun to me. Morphing a Kheru Spellsnatcher over and over again is exactly the sort of party I want to throw for all my friends. 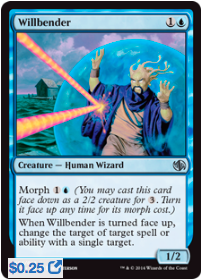 One of the major downsides of playing with tons of morph creatures is that they cost 3 mana. 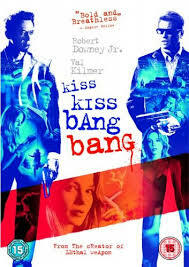 This isn’t prohibitively expensive, but is nothing to ignore either. Making all of our morph creatures cost 2 instead of 3 is an incredible discount. Also, since it’s a card that is almost never played, your opponents are unlikely to waste removal on it when there are likely other threats that will appear much more frightening. So this is what the villain in Stranger Things 2 actually does. 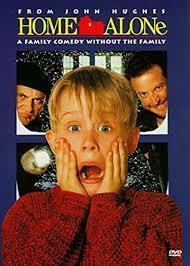 If only the crew had known that Will was becoming an illusion. Would have saved tons of time. Really though, this card is sneaky good. Turning your opponents creatures into 2/2’s can be something resembling a boardwipe, depending on the board state. My favorite part about this card is that it can more or less trap another player’s commander as a 2/2, so long as you don’t remove it. Narset, Enlightened Master and The Ur-Dragon are far less terrifying when they are stuck on the battlefield as 2/2’s with no abilities. As a bonus, any morph creatures that you have flipped gets turned back over, allowing you to get a second use out of their ability. Double the pleasure. I like to go to stores and browse through their bulk bins. One of the stores in my area has had a stack of this card rotting there for years. 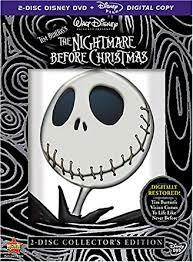 The first time I ever read it, I thought it was terrible. In all fairness, I wasn’t too far off. This card is pretty bad, except for in a morph heavy deck. It, once again, allows you to reuse any morph abilities that you may have used already. Also, if for some reason you don’t want to do this, it is a ‘may’ ability, so you aren’t forced to do so. 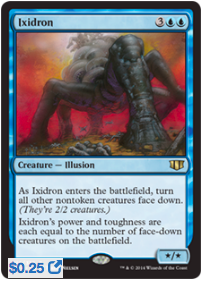 Ixidor does everything this deck wants to be doing. It makes your meager 2/2’s into much more respectable 3/3’s. This allows you to block better and to create more advantageous combat situations. While the previous ability will certainly matter in some amount of games, the true power of this card lies in its second ability. He essentially changes the morph cost of every creature to 3. Making Brine Elemental and Chromeshell Crab cost 3 to flip over is sweet, beautiful music to my ears, but something else entirely for our opponents. 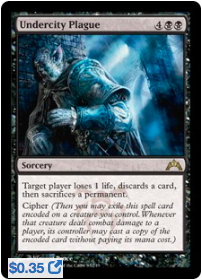 Cipher is a mechanic you won’t see very often in your average game of EDH. The only card with cipher that sees much play is Whispering Madness, but I think this card deserves more play than it gets. 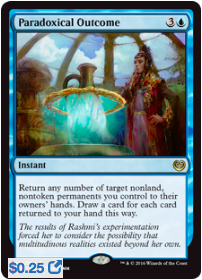 For 6 mana you are overpaying a bit for the effect you get, but when you cipher it on to one of your creatures, hopefully one of your unblockable creatures, any extra copies of the spell you get are pure, unadulterated value. I’ve wanted to play this card for a very, very long time. This is essentially the ninja version of Mindleech Mass (which we have in our deck) and that card is tragically underplayed. Being able to see your opponents hand and cast their best spell for free is just about the most Dimir thing you can be doing. This is exactly the sort of card I would like to cheat in to play with my Tormented Soul. This is a card that sees tons of play, with good reason. It’s incredibly flexible. So flexible it should be considered for playing in every blue deck. 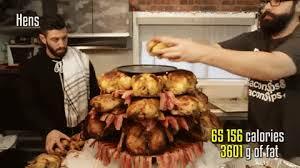 Without its kicker, it’s pretty good, but the kicker pushes it over the top, like the magic version of Epic Meal Time. The real reason this is included here is because of its specific interaction with Vela. If you cast this with the kicker targeting your Vela, you create 5 additional copies, giving you 6 total. They all see each other and the legend rule applies, causing 5 of them to leave the battlefield. This does 30 damage to each opponent on the spot. This might seem like magical Christmasland, but that’s why I play EDH. This card essentially acts as a repeatable Rite of Replication. Being able to attack every one of your opponents is great. You get any enter the battlefield effects and get Vela triggers at the end of combat. There are some truly silly things you can do with this card and ninjas. As I’ve alluded to above, U/B is notorious for being bad at ramping. As a color pair, it relies almost entirely on mana rocks, or on Urborg, Tomb of Yawgmoth and Cabal Coffers. 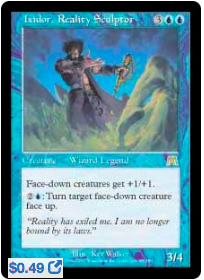 Thankfully Wizards just printed a new (sort of) colorless ramp spell. 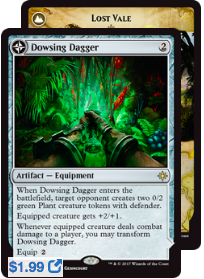 Dowsing Dagger is cheap to cast and equip and when you do damage with it, it flips into a land that taps for 3 mana. 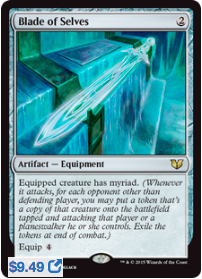 Dowsing Dagger just happens to synergize well with our unblockable creatures. If you have this card, I’d give it a shot. You’ll likely be surprised. This card is a bit reminiscent of Dowsing Dagger. It costs 7 mana to cast and we rightfully expect a lot back for our 7 mana investment. It delivers. When you deal combat damage to a player, your meager dagger becomes a horrifying game ending demon. So again, throw this on one of your unblockable critters and reap the rewards of your labor. What do you think of the deck? Are morph creatures something you find interesting, or were you hoping for something else? I think it looks like it has enough variety that I would enjoy playing it quite a bit. Let me know your thoughts down below! 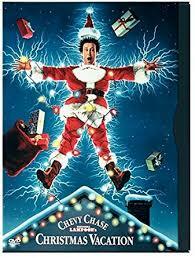 Christmas is coming soon and to celebrate, I am asking you to vote for one of the following Christmas movies. 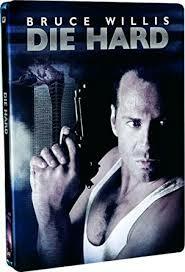 In my next article, I will build a commander deck inspired by whichever movie receives the most votes. Let me know which you’d most like to see!